For the MSX game, see King Kong 2. King Kong 2: Ikari no Megaton Punch (キングコング2 怒りのメガトンパンチ, Kingu Kongu Tsū: Ikari no Megaton Panchi?, lit. 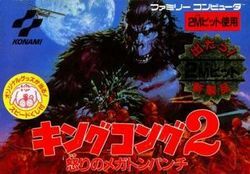 "King Kong 2: Megaton Punch of Anger") is a game developed for the Famicom by Konami, released at the end of 1986. It is a tie-in for the film King Kong 2 (released as King Kong Lives in the United States). Konami also developed an MSX tie-in simply called King Kong 2. While the MSX game closely followed the plot of the film, this game uses almost nothing but the King Kong character himself. In the game, King Kong must rescue Lady Kong, who is kidnapped in the ninth world. In order to save her, King Kong must travel through each of the nine worlds and collect every key in order to unlock the door that she is imprisoned behind. Each world consists of single screen blocks which the player can traverse by passing between connecting blocks. On each screen, various enemies will attack King Kong in an effort to deplete his health. King Kong can attack by punching the space in front of him, or tossing giant boulders which he has a limited supply of. He travels from one world to another through doors that connect two worlds together. Although the game was only released in Japan, the game is quite playable by non-Japanese speakers. Only the title screen and the game's ending are in Japanese. Everything the player needs to play the game, including the sub-screen, is in English. Despite this fact, a translation patch has been released for the ROM which will translated the existing Japanese into English, including recreating the original "King Kong Lives" logo. The patch was released by DvD Translations, and can be found here. Lady Kong has been kidnapped! And only King Kong can save her. But he'll have to collect all of the keys from each of the nine connected worlds in order to rescue her. He'll have to travel through various lands, uncover hidden chambers, and fight gigantic monsters in an effort to claim all the keys, and save the lady that he loves. This page was last edited on 14 August 2008, at 07:31.